The OM200 series Fiber Optic Power Meter has the same high performance as the OM100 series with the added advantage of a user selectable choice of 0.1 or 0.01 resolution, on board memory and a serial port connection for communication with a PC. PC software accompanies the meter for easy documentation of testing results. The OM200 series is calibrated to +/-0.2 dB of the NIST standard for each wavelength through the dynamic range of the meter. The OM200 series is designed to measure loss (attenuation) and output power of both multimode and single-mode systems. The OM200 series detectors are potted in a threaded housing for versatility and allows the user to interchange adapters for numerous connector types. This Ruggised optical power meter is the ideal tool for measuring optical power of both single mode and single mode CATV applications. When used with a laser source the AF-OM230 can be used to measure insection loss (attenuation) in single mode fiber optic cables. 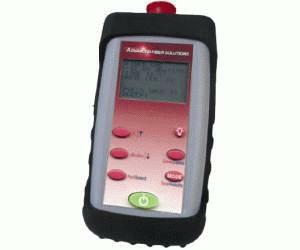 The AF-OM230 allows the user to save 500+ results and readings. Using the supplied Windows® compatible software and USB or serial connection, test records may be transferred to a PC for storage, display, printing, and analysis. This unit features a 7 button control panel - ON/OFF, Wavelength/↑, dBm/dB/↓, Zero ref/Select, Save/Delete, Test/Resutls and backlight. This easy-to-use power meter also features a 128x64 graphical display with added illiustations should as displaying the zero reference absolute value when reading in db and a full testing guide (zero referencing, single ended testing and double ended testing).